First row, from left, Ned T. Himmelrich and Michael C. Powell; Second row, Sheila K. Sachs and Jerrold A. Thrope. 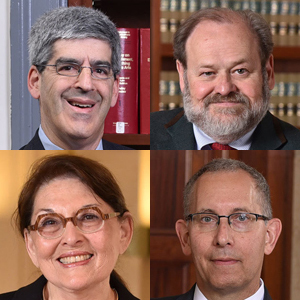 Ned T. Himmelrich, Michael C. Powell, Sheila K. Sachs and Jerrold A. Thrope, all members with Gordon Feinblatt, were named 2019 Baltimore Lawyers of the Year by Best Lawyers in America. Himmelrich was named Lawyer of the Year for copyright law. He chairs Gordon Feinblatt’s intellectual property and technology practice group and concentrates his practice on intellectual property, internet, computer, advertising and business law matters. His work encompasses the protection, acquisition, use and licensing of trademarks, copyrights and computer hardware and software both nationally and internationally. Powell was named Lawyer of the Year for environmental law. He is Gordon Feinblatt’s managing member and chief operating officer well as a member in the firm’s energy and environmental and government relations practice groups. His environmental practice focuses on navigating the environmental permit process, the defense of environmental claims, climate change issues, and the remediation of contaminated property. His energy practice includes the permitting of both fossil fuel and renewable energy generation, litigation before the Maryland Public Service Commission and the representation of energy customers and suppliers in regulatory and legislative proceedings. Sachs was named Lawyer of the Year for family law. Her practice includes litigation and negotiation of marital settlements and agreements, addressing the equitable distribution of marital property, alimony, custody, child support and related proceedings, as well as drafting and negotiating pre- and post-marital agreements. She is a mediator and arbitrates controversies in the family law area. Thrope was named Lawyer of the Year for intellectual property litigation. He chairs and is senior member in the firm’s litigation practice group. He has 35 years of experience practicing law and focuses on complex commercial, intellectual property, appellate litigation and family law. Thrope has litigated commercial matters involving contract disputes, statutory and common law business torts, antitrust, trademarks, trade secrets, patent disputes, securities law issues, partnership and corporate disputes, ERISA, employment, tax refund, construction and UCC issues.